Tonight, with the room almost completely dark, the chairs and love seats and footstools had lost their outlines and seemed to have become crouching shadows. More fancies – I am letting myself become obsessed with them, Elizabeth thought, allowing my imagination to run away with me. Still, she was glad to reach her small bedroom and lock the door behind her. Once in bed, she fell asleep almost immediately, deeply and dreamlessly. What awakened her she did not know. Sounds became magnified. The creaking of an old board somewhere outside her bedroom door was like a groan in the stillness. The muttering of the ocean seemed to rise to a roar. A fog horn far out on the water sang its melancholy song. And through those other sounds came another, so unlikely that she pulled herself up on her pillow and sat hugging her knees, her ears straining and her eyes staring sightlessly into the darkness. Surely there could not be a baby crying here in Gray House! An original Pinnacle Books edition. First printing March 1972. Our heroine, the lovely Elizabeth Lyman, is a true blue-blooded American, whose ancestors were prominent in the days before the Revolutionary War. We meet her as she is on her way to her childhood home, Gray House, situated in a small town just outside of Boston, Massachusetts. The house once belonged to her forefather the legendary John Hackett Gray, a hero of the American Civil war. These days, Gray House is open to the public over the weekends, presided over by its two elderly custodians, Elizabeth’s Aunts, Lydia and Dorothy. Elizabeth doesn’t have too many fond memories growing up in the company of these ‘stern, sour faced’ women and so her unexpected visit is not a social one. Clearing out the belongings of her recently deceased parents, she has recently come into possession of an old steel box. Inside this box are some letters, written by the late, great John Hackett himself, as well as a leather bound journal belonging to his wife. Convinced her Aunts will be ecstatic at her find and will want to preserve these treasures for future generations, Elizabeth has decided to deliver the documents over to them herself. Alas, her welcome is worse than even she could of imagined. Her Aunts make it plain they are far from happy with Elizabeth’s sudden arrival, their mood improving not a whit when they receive the diary and papers. By now Elizabeth is too tired to care. Exhausted by the long journey she just plans to say her hello and goodbyes before beating a hasty retreat back to her apartment and her job as a secretary in the Town Hall. But fate conspires against her as sickness and a broken down car force her into accepting her Aunt’s begrudging hospitality. 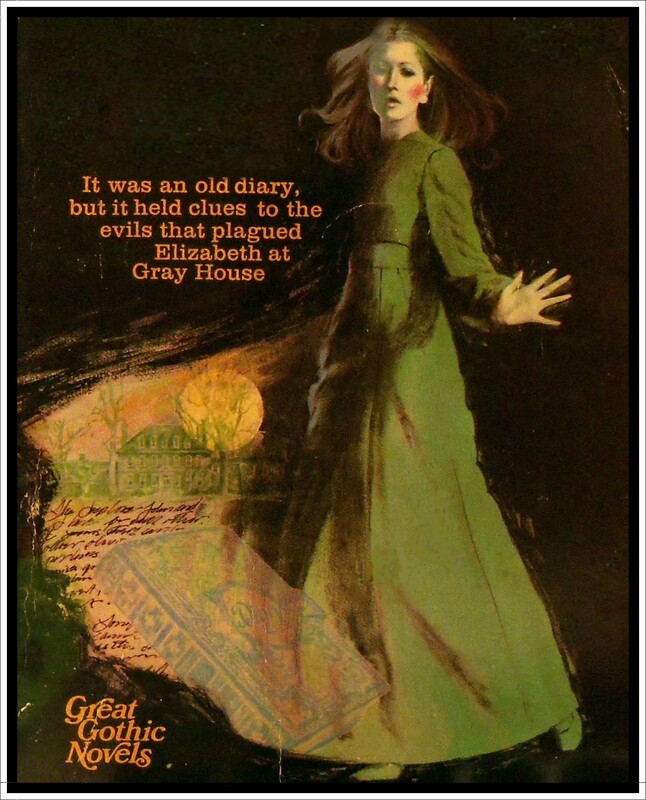 Now most gothic heroines end up in perilous situations as a direct result of having too much curiosity – with Elizabeth Lyman however, the opposite is true. For if she had only read through the old diary before handing it over (and let’s face it, who can ever resist reading someone else’s secret thoughts given half a chance?) she could have saved herself a whole heap of trouble. As it happens, the few days she spends at Gray House with her vinegar-veined Aunties prove not only unpleasant but potentially lethal. Fortunately for Elizabeth, there is a handsome young author around to lend her a hand or two, but how far can she really trust him…? 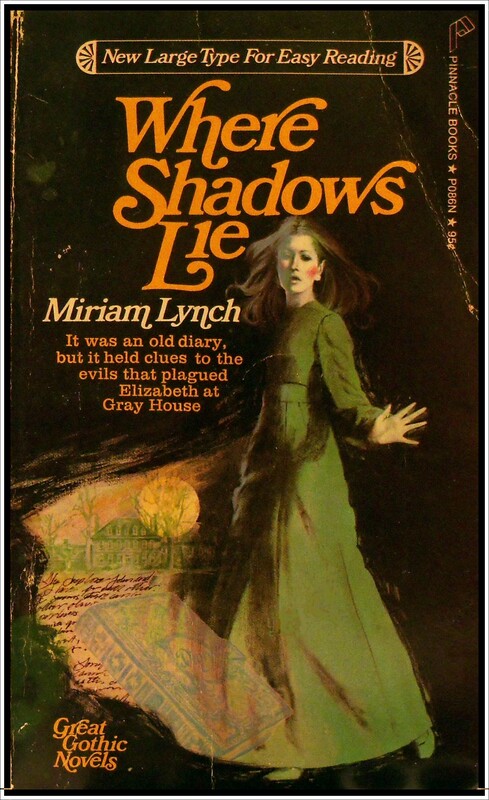 I’ve reviewed a few Miriam Lynch titles on this blog, and enjoyed them all. 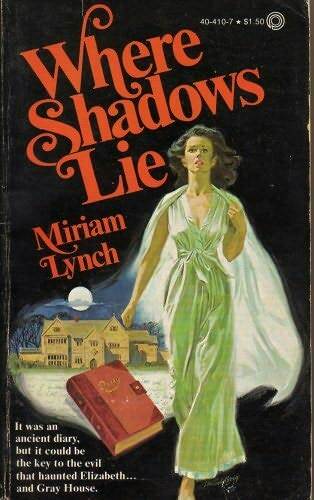 One of them, The Deadly Rose, shares a similar ‘psychotic little old lady running wild in a rambling death-trap of a house’ plot to this novel and Miriam Lynch certainly knows how to work the spooky spinster theme very convincingly. What I really like about her writing is the way she can keep a story moving – avoiding bogging the reader down in narrative – while still finding the time to lend a gothic hand to the proceedings. 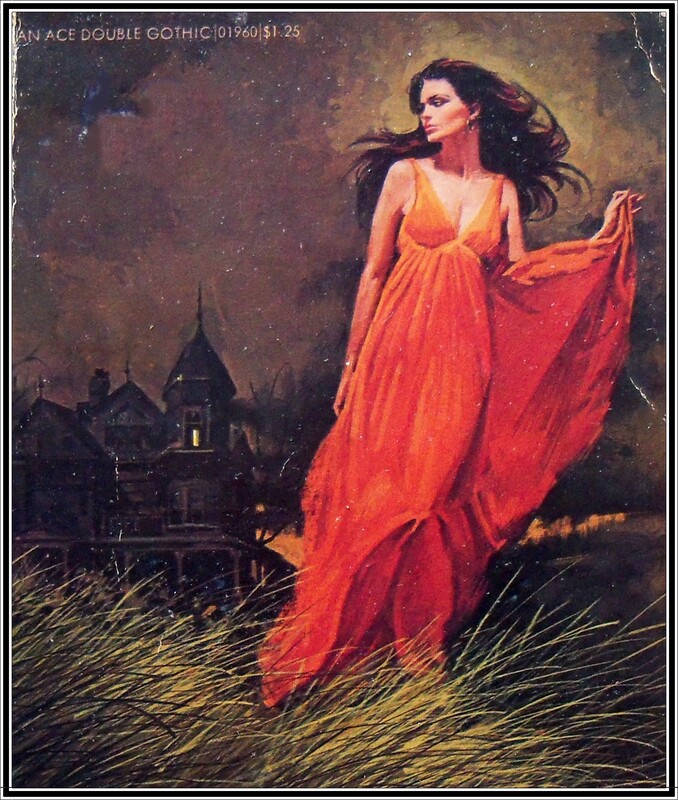 All the books of hers I’ve read contain some very effective scene setting, with wonderful terror-laden descriptions of her heroines’ state of mind as they find themselves embroiled ever deeper in danger. The cover art for this one is rather lovely too. I found a slightly more modern version (pictured above) at a Miriam Lynch book covers page here: http://book-covers.lucywho.com/miriam-lynch-book-covers-t603914.html. I’m giving Where Shadows Lie four out of five stars, with extra gothic points for the grisly discovery of two skeletons found hidden in the cellar, entwined in each other’s bones. A desperate impulse to escape an unhappy romance sent Paula Stanhope fleeing down an unfamiliar road. 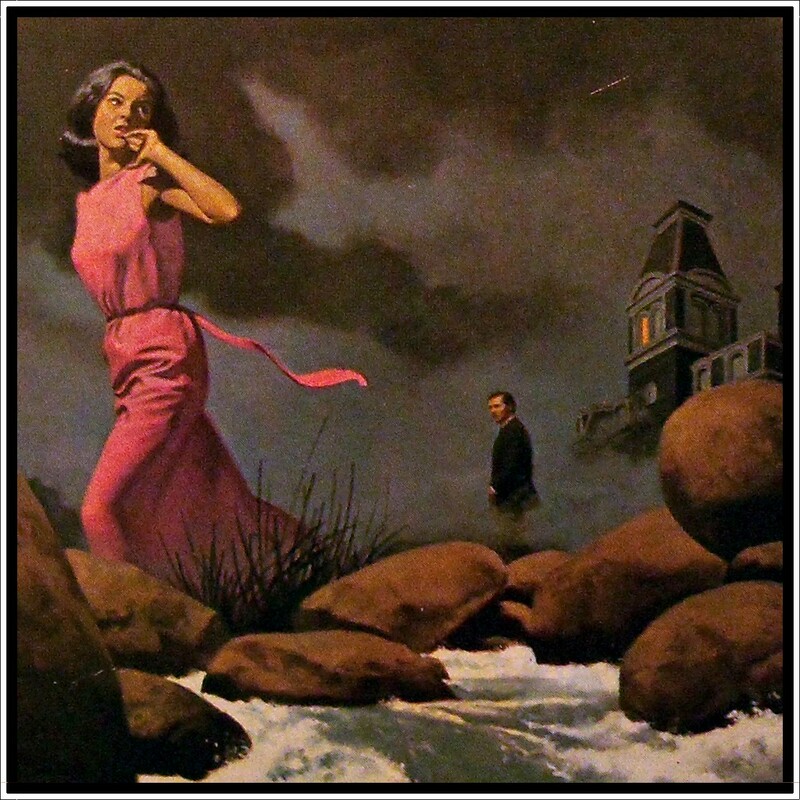 She instictively recoiled from the monstrous, evil looking old house at its end, but she needed help. She could not know that her innocent request to use the telephone would imprison her in a nightmare world of terror, at the mercy of madwomen who had no intention of letting her leave – alive…..
Blackhall had slept undisturbed among its wild and desolate surroundings since tragedy claimed its inhabitants twenty years ago – or so Susan Leyton had thought. With mounting horror she discovered that the ominous-looking castle housed a disembodied voice that demanded the young girl’s death – and a cast of characters from a distorted fairy tale who obeyed its every word. Written by Miriam Lynch. First Ace printing March 1976. Two gothics for the price of one in this edition of two novella’s written by Miriam Lynch. Both feature unlucky but plucky young women imprisoned against their will, battling to escape from gloomy, dark houses. In The Deadly Rose, Paula Stanhope’s car breaks down in the middle of nowhere. She wanders up to the nearest (only) big, gloomy mansion at the end of the road, in the hope of finding a telephone to summon help. Instead she is poisoned and held prisoner by a couple of evil old ladies who will do anything, even commit murder, in order to protect the secret stash of hallucinogenic herbs growing in their hothouse. Amber Twilight has a similar theme – Susan Leyton ventures out one wintry afternoon, to take some photographs of the seemingly empty ‘gloom-shrouded house’ that is Blackhall. Mistaken for a member of the press, and therefore considered a threat, she gets hit on the head by a misshapen dwarf, dragged into the house and held captive by the odd assortment of characters living there. To add to her troubles, a disembodied voice from behind the drapery keeps urging them to kill her. Out of the two, Amber Twilight was my favourite as the plot in Deadly Rose relied just that little too much on coincidence, especially toward the end – when chimneys started falling onto the bad guys, conveniently aiding and abetting our heroine’s escape. Both stories contain some great descriptive passages and I did quite like the quirky weirdness of the plots. Four out of five stars – With extra marks given for the fact the cover art could actually relate to the stories!